The studios of CBC’s Toronto headquarters have been the home of many popular TV series, from Mr. Dressup and Royal Canadian Air Farce to public affairs shows and music specials. But with the network downsizing and shifting production priorities to a “digital first” strategy, some of the massive sound stages and offices that supported those series in the building were declared surplus and put up for lease in 2015. The timing couldn’t have been better for advertising agency Bensimon Byrne, which was looking for larger quarters to bring its three divisions under one roof, says James Grant, senior vice-president and managing director of the company’s OneMethod division. The 45,000 square feet of space on two floors at the corner of Wellington and John streets was dramatic, including two large studios whose ceilings were 28 feet tall, a sound recording studio, and storage areas big enough to handle trucks. Distinct areas could easily be designed for the ad agency that started in 1993, its public relations division Narrative and digital and social marketing lab OneMethod. But the renovations posed significant engineering challenges, says Luc Bouliane, principal of Lebel & Bouliane (formerly Architects Luc Bouliane) in Toronto. The Canadian Broadcasting Centre, designed in the late 1980s by Philip Johnson, was built to be “disaster proof” to allow the network to continue to broadcast in any emergency. “That meant the walls are super thick concrete and the huge steel beams are under high tension” at their connections, making them extremely difficult to cut. Another challenge during renovations was that CBC’s Glenn Gould studio is right in front of the space and construction had to be halted regularly so it didn’t disturb live performances. The renovations began by cutting an entrance and reception area in the formerly seldom-used corner of the building at Wellington and John. A new grand staircase had to be installed to access the second floor where Bensimon Byrne and Narrative would have their offices. But the largest hole that could be cut into the concrete floor was five metres by five metres. That meant that to fit through the hole, the staircase had to be designed to weave back and forth with a couple of landings mid-climb. Being purpose-built to eliminate vibration and echoes, the studio walls are at angles rather than meeting in straight corners and there are layers of sand under the floors. That made for many alcoves that can be used as meeting spaces in the open concept offices. It also means the acoustics are excellent and conversations don’t carry to annoy others, Mr. Bouliane says. Mazen El-Abdallah, the creative director of Mazen Studio, which designed the interiors, says the design team faced a key question: In an era where you can work anywhere, why would you come to the office? “One of the main reasons to come to the office is to collaborate with other people, so we wanted to create lots of public space,” he says. While employees all have assigned desks, there are at least two other seats per employee that are not assigned in the office and there are a variety of collaboration zones that can accommodate two, four or more people. While Bensimon Byrne and Narrative share the open second floor, design elements differentiate their areas, with different carpet colours and wall treatments. Mr. El-Abdallah says the design team found inspiration in hospitality spaces that encourage collaboration and socialization. And while there are areas that feel reminiscent of a hotel lobby or a coffee shop, there are also a lot of places that are deliberately flexible for adaptation, like a kitchen that doubles as a studio for food photography. In an interesting reuse of a former studio space, there’s a large central zone that’s known as the agora, which features movable walls. Along one wall is a wooden bleacher-like structure where employees can sit when the space is opened up for staff gatherings. When the walls are closed, an area with a custom-designed walnut table and banks of leather sofas becomes the agency’s main meeting and client-pitching area. 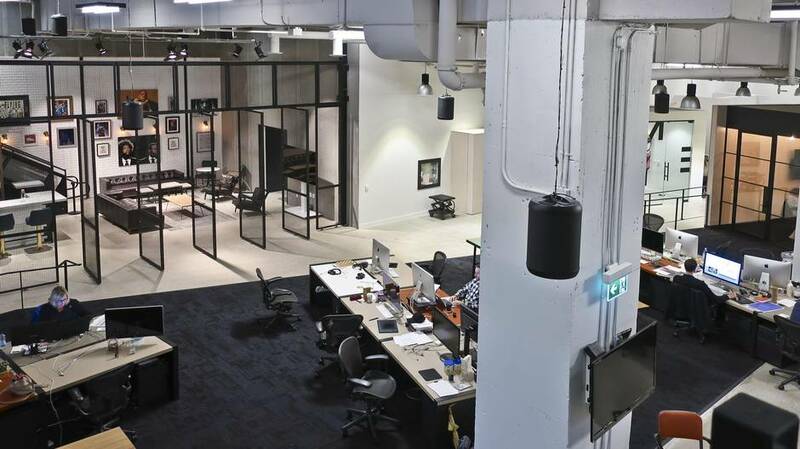 By contrast, OneMethod’s space on the ground floor is more unfinished, with a garage-like industrial feel and displays that include a line of logoed clothing and sporting goods the company designs and markets. The former studio space is so tall that a catwalk was installed overhead, and it has been used for fashion shows. It’s a deliberate design for a team that’s always experimenting, Mr. Grant says. The tables are designed to have changeable tops and the wooden counters can be sanded down if they get spray painted. And everything is movable so it’s easy to adapt to different kinds of activity. All three agencies share the printing and website development services in OneMethod. There was an existing glass wall on the north side of the building, but the renovations had to create windows along the west edge of the building to ensure the work areas receive natural light. Still in the works is to build outdoor patios along Wellington and John where employees can take breaks and have lunch. 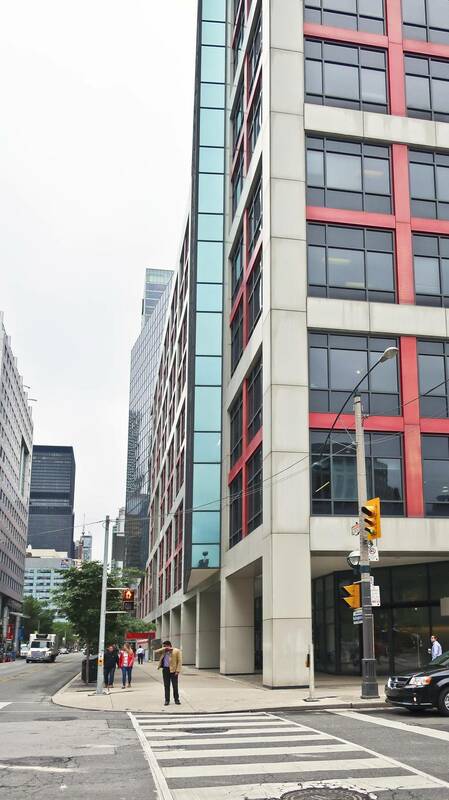 There is no cafeteria in the office; however the King Street West area is rich in restaurants and surrounding office towers have extensive food courts. “It all feels very spacious, there is room to expand substantially,” Mr. Grant says. The space is so big there’s even a basketball court at one end of a former studio. Its acoustics are so good that the sound doesn’t carry into the work area. “Having extra space allows us to move people in from other divisions and have them work temporarily on a project,” Mr. Grant says. CBC’s “digital first” strategy is shifting the corporation away from television and radio production and toward a focus on original content for mobile devices, which doesn’t require big studios to create. It’s part of a strategy announced by president and chief executive officer Hubert Lacroix in 2015 that will also include downsizing the work force by about 25 per cent by 2020. CBC estimates anywhere from 1,000 to 1,500 jobs will be eliminated, mostly through retirements and attrition. The cuts are in addition to 657 jobs eliminated as a result of a $130-million funding cut announced in 2014. The downsizing also means the corporation needs less of its available space at the 1.7-million-square-foot Canadian Broadcasting Centre in Toronto and at its regional sites. CBC has sold at least nine of its former buildings in cities including Halifax and Windsor, Ont., for example, shedding about 400,000 square feet, or 10 per cent, of the corporation’s overall space. Those facilities were moved to smaller leased spaces.